AHHHHHHHHH!! I LOVE THIS SERIES! :) Ahem... 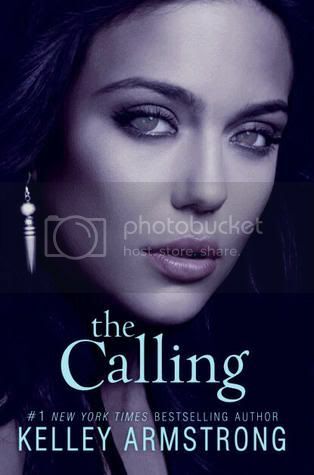 Thanks to the awesome Ruby @Ruby Reads, I discovered the cover for The Calling had been released. I love the cover, although her eyes look a bit freaky. Ah, I can't wait to read this!! What are you WoWing for this week??? Leave a comment with your link so I can check it out! I haven't started this series, and I've only read one Kelly Armstrong book, but this sounds really interesting. I'll definitely have to check it out! Wow I haven't even heard of this one until now! Whis is weird because I love Kelly Armstrong... I agree with you that the cover is really pretty but her eyes do look a little odd! Can you believe that I haven't read anything by Kelley Armstrong yet? Yes, I'm that awful. :D But this just reminds me that I have to change that soon, because I've heard so many amazing things about her books. I can't wait for The Calling! The Gathering was awesome. I have only read 'Bitten' by Kelley Armstrong but this series looks great! I have added it to my TBR pile. Oooooooo*squeals* I'm so excited for that one too!!!! And the cover looks so so wonderful!! I like it better than the first but it totally reflects the feel of the books! OMG, I am so waiting on this one too. Loved loved loved The Gathering and want this one now! Oops, I meant to say I haven't read this SERIES yet. Obviously I haven't read it cos it comes out next year. Duh. I have The Gathering on my TBR pile but I haven't read it yet, and I saw a bunch of HarperTeen cover reveal and this one looks so beautiful! Great pick! I still haven't read any of these books but I've heard wonderful things about them. Good pick! I really need to make time to read the first one...I'm sure I'm going to love it! Check out whats got us on pins & needles HERE!! Her eyes do look freaky!? I can't wait to read this either, I loved The Gathering! I haven't read the first one yet! Is it that good?? I need to. But I haven't seen a copy of this anywhere here! I actually have heard about this series,,and am wanting to read it as well,,,Im sure ill get around to it,,before the year is up..
OMG, I love this cover. The Gathering was awesome, so I am super excited about this. I can not wait for this to come out. Awesome pick! Great pick! I haven't read this series, but I've heard good things. I have read one of her books before and my students really enjoyed it as well. I'm embrassed to admit that even though I have The Gahtering on my shelf, I still haven't read it yet or anything from Kelley Armstrong. There just aren't enough hours in the day lately. Cool eyes, she looks like a seer. Is this the book after The Gathering??? I haven't read that one yet, but really want to (along with a whole bunch of other books lol!) I really like the cover. It looks totally creepy! Love Armstrongs books - can't wait to read this one! I love this series and I can not wait to read The Calling! The cover is so awesome I didn't even know it was released yet. Wow! I didn't know the cover for this blog had been released. I absolutely loved the first book and can't believe we have to wait so long for the next one :( Still...hopefully it will be worth the wait! I haven't heard of this series! But it sounds great, I really like the whole idea of it, definitely my kind of book. Thanks for sharing! I had no idea the cover had been revealed! It's cool :P. I didn't love The Gathering but I am looking forward to this one. Great pick! Really looking forward to this one! The first book ended on such a cliffhanger, but it was amazing! Great pick! The model on this cover is very pretty. Her eyes are amazing. Great choice. Great choice! The first book was awesome, just reviewed it. I didn't think it was possible for the second book in the trilogy to have an equally cool cover. I haven't read the first yet but this sounds good. Wow, beautiful cover! Is this the sequel to The Gathering? I just discovered it today and cannot wait to rad it! AHHHH! I love this series, too!!! I like this cover much better than The Gathering's cover. I can't wait!